This place is the greatest...each time I come here I feel like I'm at home and where the teacher and students really push each to train their hardest I just love coming here! 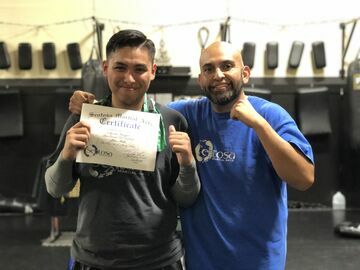 Our son started training when he was 9 years old now he is a teenager.....and we love it. It's like one big family and the instructors really care about the students! I was shy when I first started Muay Thai. I was surprised on how much confidence I was building as I was progressing through the ranks thanks to my instructors. I highly recommend going to Sentosa Martial Arts! Teenagers are smart and capable – but they can also be their own worst enemies. Between peer pressure, their innate urge to rebel against their parents, and their surging hormones, they can be impossible to be around. But all they need is an outlet for their frustrations – and an opportunity to learn how to be their best. Does Your Teen Need Help in One of These Areas? It can test your sanity even at the best of times. Yet, you want the best for your teenager. You want them to have the tools they need to succeed now and later in life – and you’d like that to happen without having to pull out all your hair in the process. Getting them to do anything you want them to do can feel utterly impossible, and you’re not sure where to start.Studying martial arts helps kids learn how to overcome their problems and learn important lessons – the kind of lessons that will follow them to your home, to the classroom, and for the rest of their lives. Raising a Teenager Requires Persistence and Patience! They’re being bullied at school – or they’re the one doing the bullying. They don’t get enough exercise or need to lose weight. They have low self-esteem and seem to be down all the time. They give up when things get difficult and fail to meet their goals. It’s very common for teenagers to make snap decisions based on their emotions, without considering the possible consequences of such hastily-made choices.In our martial arts classes, teens learn that their first instincts aren’t always their best instincts. We teach them how to evaluate situations and make wise decisions instead of fast ones.Over time, the decision-making process becomes ingrained and helps them in other areas of life, too. They Will Learn How to Make Smart Decisions! Whether they’re in a martial arts class or in a competition, the difference between a good performance and a poor one often comes down to judgment.Students learn how to make judgments on the fly using the information they have on hand in conjunction with their training.They also learn how to differentiate between good instincts and bad ones – and to use that information to make judgments. Judgement is an Essential Skill in Martial Arts! Q: I can’t believe how poor my teen’s judgment is. Can studying martial arts make a difference? A: Yes. 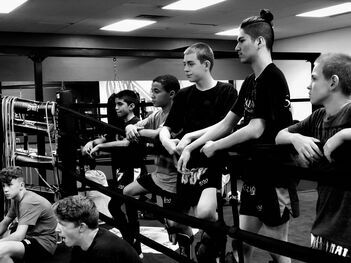 Martial arts classes require teens to learn and then apply lessons to decisions in real time in our martial arts school. That’s a skill that they will carry with them everywhere they go. Q: My teen doesn’t give any thought to how their actions affect others. Can you help? A: Yes. 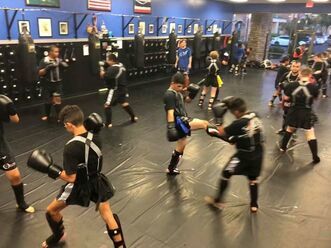 In our martial arts school, every action and decision impacts the student, the instructor, and others in the class. We teach teens that actions have consequences. Q: Will taking martial arts classes make my teenager less prone to making careless and thoughtless decisions? A: We teach teenagers the value of respect, discipline, and judgment, and they learn that knee-jerk decisions are often not the right ones. Q: Can learning martial arts make my teenager more responsible and mature? A: Yes. Martial arts instruction emphasizes the mind-body connection and teaches teens to be mindful and aware of what they do. 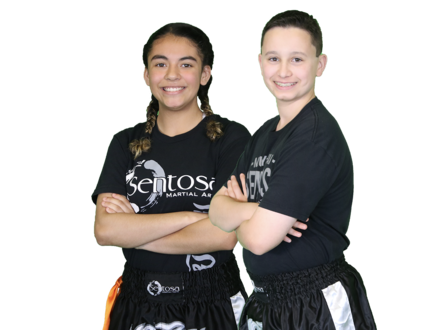 Training at Sentosa Martial Arts has made both our daughters Rachel and Rebeca more confident and disciplined as well as more physically active! Does Your Teenager Need Help Becoming The Best Version of Themselves?